First of all thanks so much to Sheralyn for sending me a sneak peek of book #4 in her Rhea Jensen series. 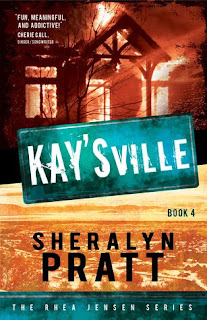 Kay’sVille felt like a companion novel as it takes a completely different point of view than the rest of the Rhea Jensen series. It is told by Rhea’s best friend Kay and fills in the details of how they met and why they are who they are. Readers may be scratching their heads after book three wondering why Kay ditched her high powered reporting job in L.A. to follow Rhea to Utah. Kay’sville fills in those gaps. Kay is a strong willed, in your face type of girl with fashion sense and an attitude… but she hasn’t always been that way. I’ve always liked Kay and now I like her more. In Book 4 we learn what her roots are, and I think you’ll be surprised as I was. Her flashbacks of pre-college life were some of my favorite parts of the book. Dahl is her sidekick cop who helps her in reporting a story and solving a mystery. He is my other favorite part of Kay’sville. My favorite scene: I loved and laughed at Kay’s description of dating in Utah. On the flipside Kay’s ville was really hard for me to read at Chapter 11 only because of a serious hazing which was committed and the details used to describe it. It was a little bit too much information and dark for me in spots. Sheralyn does a great job exploring realistically how the crime could alter the victim for life. She has reached out to readers on her blog to let them know that starting at book 4 the Rhea Jensen series is taking on heavier issues. Here’s what she had to say about the book in our interview. Tell us how Kay’sville is different from the rest of the Rhea Jensen series? I guess the most obvious difference is Rhea’s not telling the story in this book. We’re hearing from her best friend, who is filling us in what Rhea chooses not to share. Also, this book is way more character driven. If there’s any “mystery” at all in this book, it’s solving the mystery of why Rhea and Kay are such good friends. There are other real mysteries/news stories, but we don’t see Rhea’s side of the process in this book, only what Kay deals with and why she’s so quick to crack the whip on Rhea. What do you most want readers to learn about Rhea and Kay’s relationship? How would you describe their friendship? The term that comes to mind is “enmeshed.” If you step back an look, Rhea has exactly one female friend and only a few male friends. Rhea’s VERY slow to trust and let people into her life, and yet there Kay is, front and center. Rhea would die for Kay without blinking in hesitation. Kay would play human shield any day for Rhea, yet Rhea hasn’t really focused on their friendship as she’s told her side of the story, starting in Book 1. In “City of Angels” Rhea introduces Kay in such a casual way that it may not even seem like they’re actually friends. In book 2, you start to get that they have a history. By the time you read “City Limits” you’ve seen enough of Kay to start sensing that the history she and Rhea share isn’t all easy-breezy, which brings up to book 4, where Kay takes the metaphorical pen away from Rhea to write her own installment–thereby forcing Rhea to stop “protecting” her. As for what I want people to learn… Hmmm, really this book is about how pivotal the right friends can be in our lives. There are times when the people around us profoundly impact our futures. Rhea would not be who she is without Kay, and vice versa–and they honor that about each other. I guess the power of that is one thing I wanted to share with readers. What surprises do you think followers and fans are in for with Kay’sville? Surprises? Well, I think there are a few, some fun and some on the opposite end of the spectrum. I think one surprise will be how immensely human Kay is and learning where she started from, what her dreams were, and how hard she fought to get where she is. Telling Kay’s version of things was an intense process on my side. There were many times when I wanted to step in and change Kay’s story for her, but each time I was shut down. Kay’s a reporter. Getting the facts right is important to her. And the whole purpose of her stepping in to tell this part of the story is to make sure readers have the facts they need to understand what Rhea’s about to do in future books. Describe how Kay came to you and what her character is like. Wow. That answer could go on for a while. The thing about Kay’s character that separated her from other characters I’ve “met” is how dissimilar we are. Straight out of the gate Kay did not like talking to me because we had nothing in common. It was like hanging out with a muse who had the attitude of, “I don’t see the point of talking to her. She doesn’t have a clue what I’m talking about.” And truthfully, she was right. When it came to everything Kay values, I had a zero IQ in the beginning. It was only when I started caring about what Kay cares about and putting in an effort to understand her world that Kay got a bit more chatty. I think that says a lot about her character. If you give Kay an inch, she’ll give you a mile. At least that how she’s been with both me and Rhea. When you show you care, she can’t help but bend over backwards for you. Until then, though, she might just shoot you the middle finger to see if she can scare you away. Are there life lessons you hoped to portray in this book? Another loaded question. If there was one lesson this book illustrated deeply for me, it was the importance of not making snap judgments about others and their choices. Though it is a human tendency to be quick to judge and condemn, we really have no idea what people have been through and why they make the choices they do. We think we know better; we think we are smarter or more righteous, when really we’re all just doing the best that we can. Kay is. Rhea is. I am. You are. A lot of living is making things up as we go along, but the one consistent fact is that we’re all trying. No matter what our methods and their outcomes. We’re all giving it our best, and we only hurt each other and retard healing and growth when we judge and alienate others. What do you have planned for the rest of the series? Well, the next 2 books are very much about how Rhea gets out of the “contract” she never knew she signed with The Fours. It’s not going to be an easy ride for Rhea, which is one of the reasons Kay stepped in on Book 4 to drop a few secrets. Also, Kay kind of does double-duty is raising the intensity bar for future books. There’s a lot of action and hard decisions coming up. If you like Book 4, you’ll love 5 & 6. If you find 4 a bit heavy for your taste, it might be a good cue that Rhea’s upcoming gauntlet may be a bit intense or your tastes as well. How will the future books differ from the beginning of the series? Readers may notice that with each book, Rhea starts trusting readers with more and more information. She starts hiding less, the more time you spend with her. In the future of the series, readers can expect Rhea to take the metaphorical gloves off and be a straight shooter. After Kay spills the beans in Book 4 on a couple of things, there’s less for Rhea to dance around as far as keeping secrets. She’ll be able to reference things she tip-toed around before. That’s the number one way the books will differ in the future. At first Rhea wanted to keep things really light. She still wants to keep them as light as possible, but there will be times when it will be impossible. The pressure cooker around Rhea is about to develop a vice grip that will force Rhea to choose who she will be. She’ll have to make choices no one wants to make and live with the consequences. The days of simple little cases for rich clients are gone. From now on it’s not about money. It’s about who Rhea will become once she takes her life into her own hands and takes on her deepest fears… I just hope I’m up for the challenge telling the story right. OOh, I loved the first 2 books in this series and now I really want to hurry and get book three so I can have it read before this one arrives in stores soon! Thank you for the review, Heather! And for being one of the few people who understands why this book is so close to my heart.